Selling a home is a daunting task, and it’s easy to understand why. Between finding a real estate agent,finding a new home, negotiating, and moving, people across the United States regularly report that these are some of the most stressful events in life. However, there are times when selling a home is ideal, and in today’s post, we’ll walk you through three signs that it’s time to sell your home. If you’re selling a home in Gig Harbor, the Realtors® at Team Aro can help! Our mission is to make the real estate process as easy as possible for our clients, and we’d love to help you quickly maximize your home’s value. Get in touch with our real estate team today to get started! One of the primary reasons that people decide to sell their homes is due to lifestyle changes. Whether you have a growing family that needs a larger space or your kids have moved out, significant lifestyle changes can often create conditions for a home sale. A home that is empty due to children leaving can feel sad and empty, and a cramped house due to a growing family will likely create stress and discomfort. If you’re already experiencing significant lifestyle changes, why not move to a home that accommodates them? Many people decide to move rather than remodel, and this decision is often made after looking over the potential return on investment that could be secured through a remodel. Many older homes will need substantially more than a kitchen or bathroom remodel in order to significantly raise their resale value, and in these situations, it’s often financially smarter to put the home on the market. Even if you’re not quite ready to sell your home, a strong market can provide a great financial incentive to add your home to your local real estate listings. Speak with your real estate agent about your area’s current real estate market, and be sure to ask if he or she has predictions as to where the market is headed. A great indication of a strong market is an increasing price of square footage, and you should also pay attention to how long other homes in your area are on the market. If homes in your area are purchased quickly after they’re listed, then it’s probably the ideal time to begin the process of selling your home. We hope that this post will help you determine when you should begin to think about selling your home. 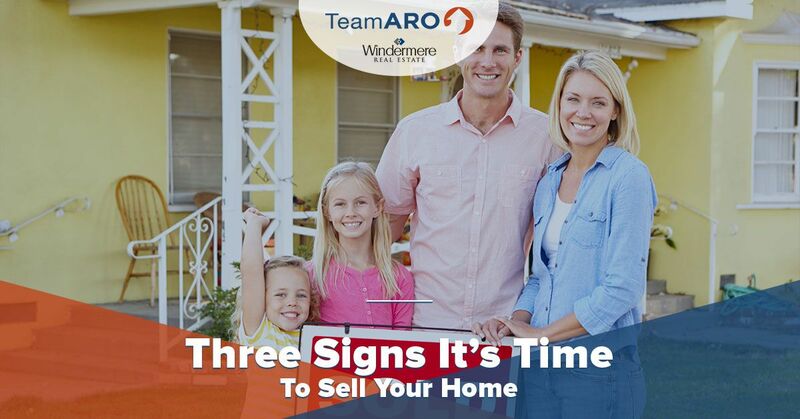 If you think that now is the right time to sell your home, Team Aro’s Realtors® can make the process simple and stress-free. We’ve helped hundreds of Gig Harbor residents sell their homes quickly, and we’d love to do the same for you. Get in touch with our real estate team today to take the first steps toward the home of your dreams!